Provide comfort for the family of Mary Hardin with a meaningful gesture of sympathy. Mary Gladys Mason Hardin, 94, passed away on March 31, 2019 at her home surrounded by her family and close friends. She was a woman of strong faith, believing in the power and strength of the love of Jesus Christ and the beauty and peace that would await her in her heavenly home. A long-time resident of Athens, Mary was born in the Mount Harmony community near Niota on March 2, 1925, to the late Roy Rufus and Lillian Hicks Mason. Baptized during her youth, Mary was a member of the Mount Harmony Baptist Church. 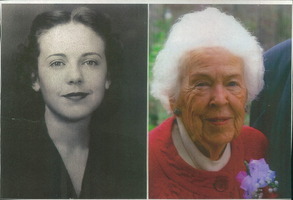 She was a 1943 graduate of McMinn County High School and a 1944 graduate of Draughon’s Business College, Knoxville. While working in Knoxville, Mary met her beloved husband, Dr. Thurman Craig Hardin, from Sheffield, Alabama, who was then an engineering student at the University of Tennessee. They were married on May 10, 1946, in her Mount Harmony childhood home and raised 2 sons, James Craig and Jon-Michael. In addition to her family, one of the delights of her life was owning and operating a Merle Norman Cosmetic Studio in Clemson, SC. During their marriage of over 53 years, Thurman and Mary lived in 5 states. Retiring from Clemson in 1983, they moved the following year to Woodward Avenue in Athens. For many years, Mary thoroughly enjoyed working in her garden. She was an active member of the the First Baptist Church in Athens, the Kanunsita Garden Club and the McMinn County Living Heritage Museum. Mary truly exemplified the spirit and determination attributed to the members of the “Greatest Generation”. Mary joins her parents as well as her husband, Thurman; her brother, RJ Mason; her sister-in-law, Polly Mason; her brother-in-law, Junior Lowry and her nephew, Gary Mason. She is survived by her sister, Hazel Mason Lowry; her son, Craig; her son and daughter-in-law, Michael and Patricia; 3 grandsons and their wives: Tom and Sue, Jim and Kathryn, Al and Haley; and 9 great-grandchildren: Sophie, Carter, Molly, Banks, Layla, Victoria, Claire, Wright, and Mac, as well as a host of cousins, nieces, and nephews. The family wishes to express special appreciation for the love and support extended to Mary by her friends, by the members of the Mount Harmony Baptist Church, by the team at Dominion Senior Living of Athens, by her personal caregivers Sheree Blankenship and Stephanie Mason, and by the staff at Hospice of Chattanooga. The family will receive friends from 5:00 pm to 7:00 pm on Friday, April 5, at Smith Funeral home, 1010 S. White Street, Athens. Funeral services, with Rev Stanley Hammonds officiating, will be held at 11:00 am, Saturday, April 6, at Mount Harmony Baptist Church, 130 County Road 362, Niota. Burial will follow at the adjacent Mount Harmony Cemetery. Pallbearers will be Carey Hicks, Mark Lowry, Mike Lowry, Eddie Mason, Matt Mason, and Dolphard Walton. In lieu of flowers, donations may be made to the Mount Harmony Cemetery Fund, c/o Janette Mason, 195 Co. Rd. 361, Niota, TN 37826. To send flowers in memory of Mary Gladys Hardin (Mason), please visit our Heartfelt Sympathies Store. Provide comfort for the family of Mary Gladys Hardin (Mason) by sending flowers. Thank you Craig for letting me know of your Mom's death. This evening our family will pray for you all in this difficult time. Joel Mason.